Space pirates, corporation heads and asteroid miners are up in arms at the moment, as a result of a proposed change to Eve Online’s PLEX system. As part of these new changes, CCP are planning to get rid of the old Aurum currency, make PLEX a more granular system and create a special PLEX vault for players to hold their space dosh. If you’re looking to start your Eve Online career, you must read our beginner’s guide. For those who may not be aware, PLEX is an in-game currency in Eve Online which allows players to extend the amount of time they are an Omega pilot. A relic of Eve Online’s old subscription model, PLEX can either be bought for real life cash or with Eve’s standard currency, ISK. When combined with Aurum, a separate premium currency used for buying in-game skins for your ships via the New Eden Store, the internal economy for Eve Online was more complicated than it needed to be. So, this grand economy change is set to centralise PLEX as Eve’s only premium currency. From when this change goes live, a single PLEX in the old system will now be worth 500 PLEX. This means if you want 30 days of Omega game time, it will now cost 500 PLEX rather than simply 1 PLEX. According to CCP, this change allows them to sell smaller PLEX packages and gives players greater options to trade PLEX. As part of this change, players can now put PLEX into something called the PLEX Vault which gives multiple characters on the same account access to your total PLEX balance. You just need to drag and drop your PLEX into this Vault and it can then be parceled out and shared among many characters. It also makes it safer for newer players sitting on their first stack of PLEX from being farmed by space pirates who are looking for a quick buck. So far, so good right? Well, as part of this total PLEX conversion, CCP are planning to completely phase out Aurum. 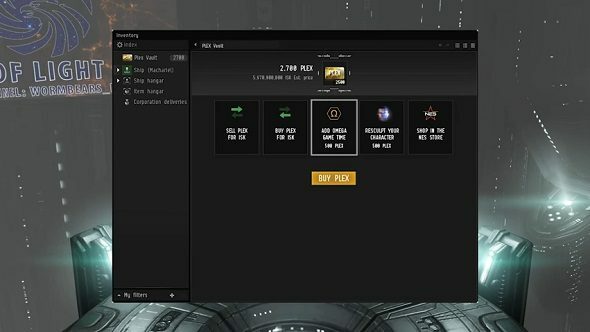 While you could previously convert PLEX to Aurum or buy Aurum with real money, this new system will get rid of Aurum entirely, with players now using PLEX in the New Eden Store. To account for players who may still have large stacks of Aurum, all players with an Aurum balance of over 1000 will have it converted to PLEX. However, any Aurum balance under 1000 will simply be wiped off the books. When you can still buy Aurum for real world cash (with 900 Aurum going for around $4.99/£3.99), CCP are essentially making money disappear from the accounts of Eve Online players. For obvious reasons, there has been quite the backlash to this change, especially when CCP gave out 300 Aurum as a Christmas gift to all players. With the current Aurum to PLEX exchange rate being 3500 Aurum to 1 PLEX, many players are asking why smaller Aurum values can’t simply be converted to game time so nobody loses out. Others are asking to have Aurum made into a tradeable in-game item, so players can sell it for ISK and not waste the money they have lying around in their accounts. Moreover, many contend that the PLEX vault removes a large amount of risk to playing Eve Online, as you can safely move your PLEX into the vault without having to worry about some raider jacking all your precious currency. For a game about destruction and theft, many contend that it is an unneeded safety net for a game set in a cutthroat universe. The in-game prices for PLEX have already inflated after news of this change and while many prefer the granular nature of the new PLEX system, the response has been overwhelmingly negative. The team behind the PLEX system and the new changes have been monitoring most of the communication and feedback to the change, so expect some clarification and changes to the proposed system to emerge next week. No date has been announced for the economy changes so hold onto all that precious Aurum till we know more.